This entry was posted in Liturgy, Lutheran and tagged christian unity, church, church unity, lectionary, liturgy, narrative lectionary, preaching, revised common lectionary, the story. Bookmark the permalink. Hmm. On the Old Testament are you confusing the ‘related’ cycle of readings and the ‘continuous’ cycle of readings? (Our NZ (Anglican) Lectionary offers both). As for too much focus on the four gospels. That sounds a little odd! At least in our church, the continuous (or as it is called here, semi-continuous) reading is listed as an alternative. Plus, it gets scant attention in most preaching commentaries (which spill much more ink, or many more pixels, on the Gospel text than any other text for a given Sunday). Furthermore, at least in our lectionary, the semi-continuous readings are offered only for about half of the year (Trinity Sunday through Christ the King). Anyway, my point is that one need not read from the four evangelists to proclaim the Gospel, and that ordering a year-long (or a three-year-long) reading cycle around the rhythm of the Gospel narrative is limiting. For Christians, particularly liturgical/sacramental Christians, Christ is always front and center, and is found in, with, and under the hymns and text of our liturgies. I preach often on texts other than the Gospels. I always proclaim Christ. I left the RCL behind for the SOLA Lectionary because it truly accents Law and Gospel as well as dares to truly touch accountability and the work of the Holy Spirit! While I understand your point about the problem of all that material that falls in the summer holidays, if you remember that the whole world does not live in the Northern hemisphere, then redoing the Lectionary to take account of everyone’s summer holidays would mean that we’ve got about 12 weeks a year where we avoid saying anything important because everyone’s away. I will be representing Australia at this week’s annual meeting of the English Language Liturgical Consultation (the custodians of the RCL), and South Africa and New Zealand will also be represented, so although I intend to draw your comments to their attention, the concern about holidays will probably be dismissed as coming from an overly parochial view of the world. Your comments about the use of the Hebrew Scriptures are well made. But, in defence of the RCL, it is an attempt at being ecumenical, and it started as a revision of the Vatican 2 Roman Lectionary. The ’92 version introduced the semi-continuous OT readings as a response to the same criticisms you are still making. You are right that your own denomination lists it only as an alternative, but that is a denominational decision. Most other denominations follow the original book and list them the other way around. And although we could try taking it further, Rome has not even come with us this far, and your denomination elevates it to an alternative, so the dilemma is about whether we take it further and reduce the chances of a greater unity, or do we just push ahead as though such unity was of no consequence. Not an easy call, but one that we do take seriously. Thank you for your comment, blessings with your work on the ELLC. The summer months (and worship attendance dip) may be a parochial concern, but ultimately parochial concerns – those of my parish – are my main concerns. I don’t envy the tasks had by you who are committed to stewarding a common, ecumenical, global lectionary. That ultimately is not my commitment, and the ebbs and flows of seasonal life of our parish shape our ministry of the Word. 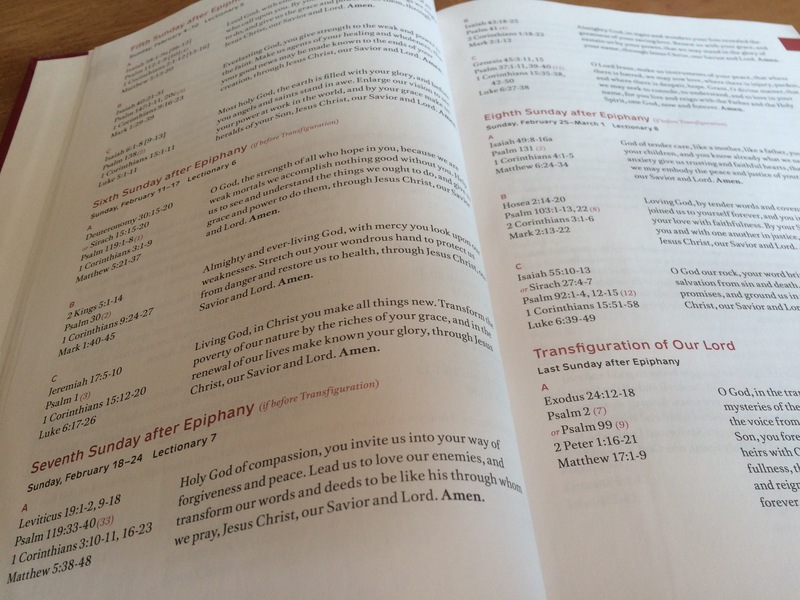 Though it has its own problems, we chose to use the Narrative Lectionary (out of Luther Seminary) because it takes our September-May ministry season seriously. The primary cycle of readings is scheduled from September to May. During the summer the Word is still proclaimed, of course, but we then look at a few series, such as on the Psalms or on Parables or something of the sort. FWIW, many of my RCL preaching friends do the same, setting aside the RCL for the summer and doing series on “top questions” or on certain Biblical or current themes. Again, thanks for the comment and for your work. I am curious, has anyone has addressed the time and resource differences and difficulties faced between the RCL and the Narrative Lectionary? As a lay leader who is often putting together the non-preaching elements of worship in two congregations, I have found that I spend substantially more time, effort, and money, gathering resources for the congregation that used the Narrative Lectionary verse the RCL. While there are resources (prayers, images, hymn ideas, etc.) available for the NL, sometimes the quality isn’t there, or it is provided in limited formatting. For small congregations who do not have the staffing, nor the volunteers, the extra hour or two a week adds up when you are functioning off of 1 or 2 PT staffers, including the pastor. From what I have seen, meant that other vital aspects of ministry were cut short. While I do see this improving each year, I see what the NL is now as a beta version. It is being test played by those who have the time / energy / interest to report bugs to the developers. Writing as a scholar of the Old Testament, this post makes me very sad. While the rest of the world has now for some decades been aware of the postmodern critique of constructed meta-narratives, it seems that a fair number of ELCA pastors have launched headlong into a new one. The RCL is far from perfect, but I would say that it does a fairly adequate job of highlighting the intertextual nature of the New Testament–a feature that’s absolutely essential for understanding and interpreting the biblical text and its portrayal of Jesus Christ. Literarily—and we are speaking about texts here—Jesus is the Word as intertext, explained in the New in the categories and language of the Old. If we fail to set the two in juxtaposition, this essential hermeneutic is simply lost to the wind. I would say that the RCL is not really the problem, but the inability of the majority of preachers to effectively preach intertextually. The RCL also properly keeps the Gospel (here, the Evangelists) at the center of worship and preaching–truly a defining feature of Lutheran worship as Timothy Wengert recently reiterated at the ECLA Worship Jubilee. Certainly it’s possible to proclaim the Gospel from another biblical text but there’s I think good reason that the Evangelists have been at the center of the Western liturgy as far back as we know. In opposition, the NL strips the Old Testament of almost everything the creators deem to not constitute “narrative.” That’s an extremely poor criteria for choosing biblical texts for worship, in my opinion–however I’m sure it readily appeals to preachers who would rather preach from prose than wrestle with something like biblical poetry. If it were broader in scope, the NL might perhaps be a fit for certain churches in the Reformed tradition who early on departed from the Western liturgical tradition in this regard.